Miles Edgeworth is claiming that his name is Benjamin Hunter, and that he is a prosecution lawyer. Benjamin Hunter wasn't charged with murder, but he did run afoul of France's so-called “burqa ban” that prohibits full face coverings. While he was in France, he allegedly tried to associate with fans of the Steel Samurai media franchise, since he allegedly is a huge fan of it. Mr. Edgeworth, as Benjamin Hunter, attempted to set up a local convention of like-minded Steel Samurai fans for friend-finding purposes. While promoting it, he disguised himself as the Steel Samurai, which also involved wearing a face-covering mask. French police didn't like that, and they gave Benjamin Hunter a 150 Euro fine. Being a litigious man, Benjamin Hunter contested the fine in court. Ernest Amano, of the Amano Group, has been funding Edgeworth's overseas trips. 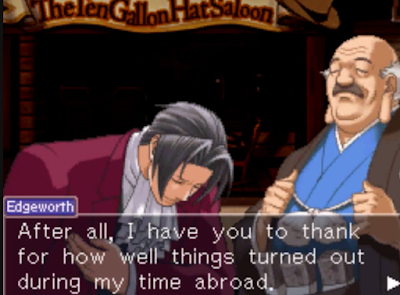 About two months ago, Miles Edgeworth returned to the United States — leaving his Benjamin Hunter persona behind — to take the role as United States prosecutor once again. 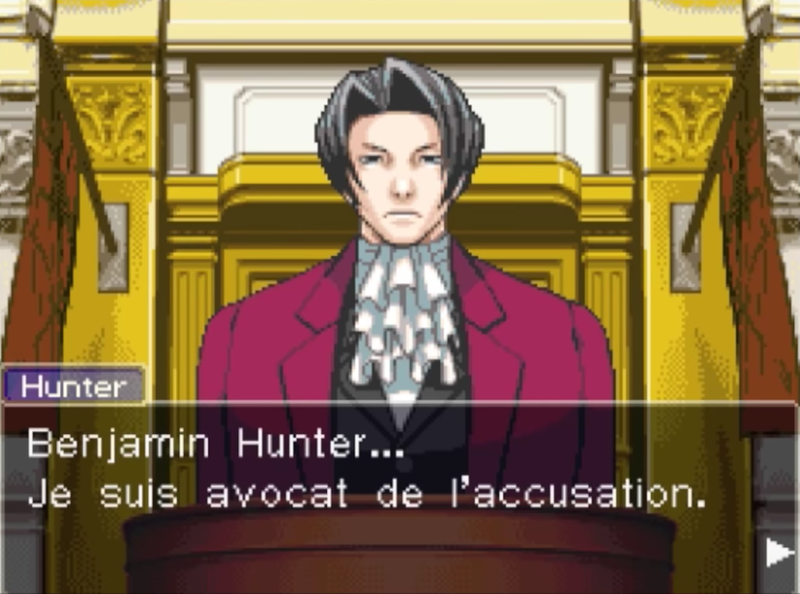 He faced off against Phoenix Wright in court in the Juan Corrida-Matt Engarde trial, where Miles Edgeworth proved that The Nickel Samurai actor Matt Engarde hired an assassin, Shelly de Killer, to kill rival The Jammin' Ninja actor Juan Corrida. He was relieved to once again be in the company of Steel Samurai fans (even if some are murderers or dead), which was his true reason for taking the case to begin with. Having defeated Phoenix Wright in the courtroom with his newfound power of truth, Miles Edgeworth decided to... return to Europe. What? He just came back to America for one trial for only a few days, and then he just goes and flies back to Europe? Why? With all of the stabbings and terrorism happening in Europe, what good does it do to keep going there? They don't even like The Steel Samurai there! “Death by Europe” is the return of an old phenomenon, going back to the days of feudal lords and jerk kings/dictators constantly having war. It's the travel equivalent of “suicide by cop.” From staff member Vortexica continuously getting into all kinds of danger in the United Kingdom (including the newest danger written about just last week! ); to former staff member Roxy quitting KoopaTV to join the BBC but we've never heard from her ever again even though we're her references; to confirmed-alive staffer Kamek going to Paris for a trip but getting kidnapped by the Taliban... Europe is nothing but trouble. 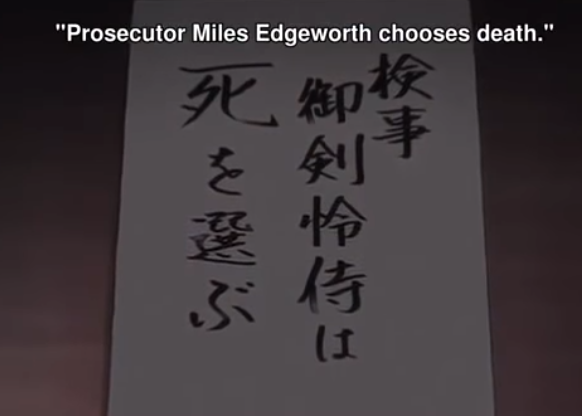 Based on Miles Edgeworth's self-destructive behaviour, the only logical conclusion is that the mantra “Prosecutor Miles Edgeworth Chooses Death” continues. He might even be dead as of writing. We're going to memorialise this sad and confused young man. ...And if he'll somehow get through his European trips alive, then we'll memorialise the general fall of Europe that necessitates this article even being written. As staffer RawkHawk2010 has written as it relates to Ace Attorney, “Who would want to go to Europe in 2016?” and “Don't go to Europe.” Europe has only gotten worse since 2016 and 2017, folks! Ludwig knows that Memorial Day is for those who died while serving in America's armed forces, but KoopaTV isn't obligated to care about American customs. He has never been to Europe, since he doesn't want to die on a continent that hates freedom. He also realises that Miles Edgeworth, while a famous lawyer, may be seen as a random lawyer out of California to people who don't follow the legal world, so maybe this article won't get traction. Hasn't stopped Ludwig from recently writing about a random circus out of the same part of California, though. In a very appropriate prequel to an article about a probably-dead lawyer, is 2017's Memorial Day article about how the law in general is dead. 2016's Memorial Day article is about a warrior who died serving armed forces... plural. And competing. 2015's Memorial Day article is about fallen Troopas from Koopa Kingdom's armed services. They were also former KoopaTV staffers. The 2014 Memorial Day article is about Super Smash Bros. Brawl, which is now considered a retro classic. 2013's Memorial Day article is about Paper Mario: Sticker Star murdering the franchise. A bit premature, much like this article probably will be. At least a month later, Miles Edgeworth is still alive... but someone else died instead. In Europe. The title is literally the text of his suicide note, an em-dash, and "By Europe"; which the article explains is similar to "Suicide By Cop". Plus, "Death of Europe" is a little different than "Death by Europe". KoopaTV has a pointed "Europe is a death trap" theme for years now, and we want to make it more clear that it extends past just the United Kingdom. Death of Europe means Europe is the murder victim, while Death by Europe places Europe as the murder weapon. Though, Europe is also a murder victim in this. I don't think Phoenix Wright will even want to accept this case. ...Yeah, if there is a case at all.